I was standing at the ready with a shell in the chamber and my finger on the safety when I heard the most God awful sound of my life- the bull of my dreams was responding! You could hear the giant moose turn around in that alder thicket and it sounded like King Kong coming straight toward us. It was a bit unnerving. George grunted again softly, steering the excited giant to us! We could tell the bull was going to emerge within 30 yards of us, and I stood at the ready while George hunkered down. Just as sure as George had predicted, that randy moose emerged from the bushes ready for a fight! He looked straight at us, put his head down and started rotating his massive headgear. The big bull wanted to make sure we could see exactly how big he was. This is the story of my trip to Alaska where I hunted moose and brown bear with George Siavelis in the fall of 1995. It all began on another hunting trip where I met Tom Cwyner who told me about a fantastic trip he had been on with George. I must say before I go any further that George Siavelis is, without a doubt, one of the most sincere, hardest working hunters and guides that I have ever been with. He is truly one of those professional hunters who thinks like the animal that he is hunting, and when I get done telling you this story you will know why I say that. Anyway, after discussing with George on the telephone, all of the details of his operation, the conditions and situations we would encounter, I booked a moose/brown bear hunt with him. George prepared me very well for the hunt before I ever left home. Late August 1995: I flew to Aniak, Alaska (where George lives) via Anchorage. I was met at the Aniak airport by one of George’s associates. I was very well taken care of. I still wasn’t there yet. Next I had to board a float plane to fly out to some unnamed lake where I was to meet George. George had already been in the field a couple days setting up camp and scouting. He got me all worked up when he told me about 2 different brown bears he had seen the day before. One he considered to be at least 9 feet square. We spent the first day of the hunt just as we would the next several days. Basically glassing all day in search of large trophies. We saw plenty of animals. We saw caribou everyday, some of them quite impressive. Many of them at very close range. 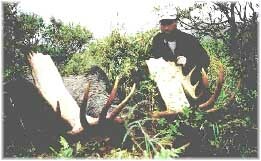 One bull caribou that we watched for two days might of made the Boone & Crockett record book, but I wasn’t really hunting caribou, and we believed a large brown bear to be nearby on that same mountain and we didn’t want to spook him. George’s best estimate put the caribou probably scoring somewhere around 390+. The weather was miserable most of the time. We stuck at it, but the days sure were long. George is absolutely relentless ; when you book a hunt with him, you’re going to hunt, no “ifs”, “ands”, or “buts” about it. No amount of whining or pleading would convince him to let me stay in the tent while he went out and spotted game. Seriously, George inspired in me a desire to go out and hunt. He was a tremendous guy to be with in camp, and I felt a real comradery developing between us. 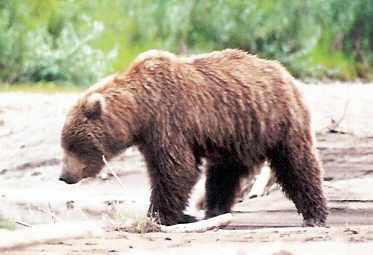 We saw brown bear sows with cubs, but neither of the big bears that George had seen days before. There were plenty of huge tracks along the creeks and lake shore made by large bears traveling alone (some of which were a full 9 inches wide) but we couldn’t seem to find the bears who made them, at least not in the beginning. On the morning of the 7th day we climbed up to what was going to be our glassing hill for the day. As soon as we sat down, we spotted two moose below us about 400 yards away. One was a cow and the other a young bull to small to consider. Shortly after, we saw another bull moose very close to us, but he too was too small to consider taking. Later while we were eating lunch, I saw something that appeared to be a huge deadfall out in a small meadow, but I was pretty sure it hadn’t been there just a moment before. I asked George about it who at the time was eating his sandwich a few yards away and looking at something else. The spotting scope was next to me and George suggested I take a look through it. About 100 yards from this bull were two more bulls laying down. After looking over the bulls George got pretty excited and said,” John, those are damn nice moose, everyone of those is a wall hanger.” Just then, the biggest of the three got up and walked over into a very thick alder thicket. George estimated him to be about 65 or 66 inches wide, with large palms. The bull was a long ways from camp so we discussed at length whether we should go after him or not. If I took him, I probably wouldn’t get a brown bear, but then again it was the biggest moose I had ever seen live, or in any hunting camp taken by any hunter. I could hunt the rest of my life and not get another chance at such a moose. After careful consideration, and challenging George’s manhood, we decided to go and get one of those moose. Even the two smaller ones were over 63″. George took off like he had rockets strapped to his buttocks. Three miles later, huffing and puffing, we reached the knoll we were aiming for. The two 63 inch boys were still out in the open meadow about 400 yards from us. It wouldn’t have taken much stalking at that point, and I would have been happy to take either one of them. “We’ll try and call him” George replied quickly. I laughed, and covered my mouth so the other moose wouldn’t hear me. We then walked several hundred yards up the hill through alders. We came to an opening running up the hill. We followed it up a ways until George stopped and said that we should try from right there. George cupped his hands over his mouth and started emitting some pretty weird noises, known to him as cow bawls. He also used several lower pitched noises that sounded even weirder. The big bull thrashed brush and trees as he came towards us. It sounded like he was tearing down the forest! Far reaching antlers first, then a massive body too, stepped out from behind the trees! I hesitated for a moment because of the bush in the way, however I could clearly see the bull’s outline through the bush and he was only a matter of a few yards away. George urged me on, so I fired into the bull’s other shoulder. The huge animal collapsed instantly, and I could swear I felt the ground shake as he collided with the earth. George and I stood over the fallen monarch in awe. We both realized and appreciated this great animal and the magnificent trophy that he was. He turned out to be 67″ wide with very large palms. After skinning and butchering the massive animal, which proved to be a task in itself, George had a packer flown in to help us. We spent the next five grueling, but what turned out to be very rewarding, days packing moose meat. We bumped into caribou everywhere it seemed. 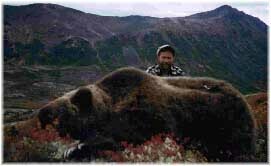 A large brown bear got on the kill and another bear raided our meat cache on the hill. On day thirteen we were glassing the hillsides from camp, waiting for the pilot to come and pick up the last load of meat. We spotted a large brown bear coming down the mountain straight to us. George estimated him to be a solid 9 footer. We watched as the bear continued on his unaltered collision course with us. George explained that there was a pretty heavily used trail coming down there that the bears used to come down to the lake. If the bear continued on the trail as he seemed to be doing he would more or less come right to us. About the time when George & I were discussing what we were going to do, a plane came roaring around the mountain to land on the lake. It was our pilot. The big bruin darted into the alders. Of course it was very disheartening to say the least. We loaded the meat on the plane, and told Ralph the packer, and the pilot that we would see them the day after the next. We glassed for the rest of the day, but never saw that bear again. I knew that the next day would be my last full day of hunting. Believe it or not, I wasn’t worried. I have been on quite a few hunts and seem to be one of those last day kind of guys. I felt like something would present itself, and I knew George’s capability would help me capitalize on it. That night before turning in, a bear was growling behind our tent only a few yards away. A short time later, we heard a bear roaring way up on the mountain. It seemed the bears were coming our way, and it was exciting. George even loaded a round in his chamber as he laid his rifle on the tent floor that night. I didn’t sleep too sound that night. I expected a visitor, but it never happened. As I slowly inched forward, I noticed George stuff a rather large hunk of snuff into his mouth. I belly crawled forward and looked over, but no bear! We could see quite a bit of open hillside and became concerned that the bear had gone into the alders. George pointed to another almost indistinguishable little swell of land a few yards away that could be hiding the bear from our view. We crawled as quietly as we could, knowing that if he was there, he was close! As we inched over the tundra looking and feeling with every bit of all our senses, George pointed to the large hump of a grizzly sticking up 60 yards away. We inched a few steps further. The powerful bruin was feeding on berries with it’s head down. I crouched down to wait for a second as the bear was turning around. I slowly raised my rifle up to my shoulder, eased off the safety, and felt carefully for the trigger. I never quite felt this alive before! I was out in the wide open, and this bear was close. It was broadside and I squeezed the trigger into it’s shoulder. The griz wheeled around and roared. He looked ready to charge. I shot again, but still the bear did not go down. As I was chambering another round, with the bear still growling and snapping, George fired his .375. The bear collapsed silently. George instructed me to put one more into him for good measure. The next day I had to fly home. I flew home with a lifetime worth of memories though, and made a vow to return. George and I correspond regularly and I’m looking forward to hunting with him again. Maybe we can name another lake or river together! !